Moxa’s newly-launched industrial-grade video encoder, the VPort 461A, is a single channel video encoder that delivers multiple full D1 H.264 and MJPEG video stream transmissions for high performance IP video systems. Moxa offers security professionals a seamless viewing experience with an end-to-end system latency of less than 200 ms. Complying with ONVIF specifications, system integrators and end-users can easily integrate the VPort 461A with any existing IP-based security system, enhancing interoperability and deployment flexibility. 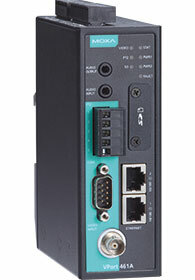 The VPort 461A H.264 video encoder is designed for harsh environments and supports a broad spectrum of rugged industrial features, including wide temperature tolerance from -40 to 75°C, IP30 form factor protection against dust and rain, industrial certification (UL 60950), as well as the regular EMI/EMS standards. To demonstrate commitment to product reliability, the VPort 461A comes with an industry-leading 5-year warranty. To increase network transmission efficiency, Moxa’s innovative DynaStream function is designed to change the video frame rate automatically, in accordance with the current status of the network bandwidth, thus making the management of the network system easier. Additionally, an advanced bit rate flow control technology, CBR Pro, is built in to guarantee the lowest levels of packet loss in limited bandwidth transmission, ensuring images do not exhibit the mosaic effect. An SD card slot is incorporated into the VPort 461A for local video recording via an SD card. It can support SD cards larger than 64 GB by utilising the SDHC/SDXC interface. Currently, local video recording can be triggered by an event or an interruption in network connectivity, which provides the added security of preserving important video images if there is a problem in network transmission or with the NVR.